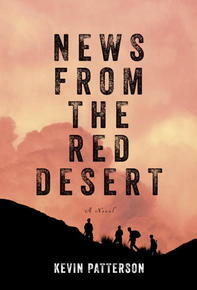 Today's chat is with Kevin Patterson, author of the critically acclaimed novel News From the Red Desert. It’s a book that brings readers into the heart of the Afghanistan conflict and introduces us to men and women whose lives are forever changed by the war. Kevin Patterson grew up in Manitoba, and put himself through medical school by joining the Canadian army. 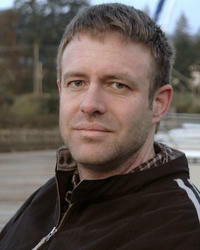 Now a specialist in internal medicine, he practices in the Arctic and on the coast of British Columbia. His first book, The Water In Between, was a New York Times Notable Book. Country of Cold, his debut short fiction collection, won the Rogers Writers' Trust Fiction Prize in 2003, as well as the inaugural City of Victoria Butler Book Prize. He lives on Saltspring Island, Canada. Trevor Corkum: Your novel News From the Red Desert is set largely in and around Kandahar Airfield during the height of conflict between the Taliban and coalition forces in spring of 2007. What inspired the novel? Kevin Patterson: In 2007 I worked in the Role 3 hospital in Kandahar as an internist/intensivist. It was a powerful and disturbing experience. I’d not seen war up close before, and found myself recalibrating much of what I thought about militaries and the stories we tell ourselves about war. TC: While Deirdre O’Malley, an American war correspondent, is one of the book’s key protagonists, you bring to life a rich ensemble cast of characters. We meet Rami Issay, the dreamy Pakistani owner of the Green Beans café; two ambitious and competitive American generals, Jackson and Lattice; Thai masseuse Just Amachai, pining for her young son back home; and a jaded American supply sergeant, Anakopoulus, just to name a handful. Which of your characters were easiest to bring to life, and which were most challenging? KP: I think I liked Rami Issay the most, and felt a kind of affection for him that made it easier to spend time in his head. The other baristas at the café were harder men, and little less easy to inhabit. Anakopolous was challenging; he is stuck in an idea of himself that does not permit to move forward or backwards, and the distress of that situation is an important part of what leads him to do what he does, and get into the trouble he finds himself in. His anger and his frustration made him harder to get a grip upon. But a book about only likeable characters would be a little dull. In the end I had sympathy for him, even if I didn’t like him so much. A book about only likeable characters would be a little dull. TC: The men and women in your novel find themselves in Afghanistan for various reasons—some personal, many professional. You were a military doctor who served in Afghanistan. Can you talk more about the real-life motivations of soldiers and civilians alike for wanting to take part in the war effort? How difficult was it for the folks you met, lived, and worked with to transition back to “regular” life in Canada? KP: I thought everyone I met there was trying to help Afghans. There were adventurers, as there are in all wars, of course, and many of the long-time soldiers were simply there because that’s what they did for a living. Still, I think virtually everyone I spoke to expressed some degree of idealism about the mission. This of course compounds the pain arising from how things have turned out there. The people I knew were mostly medical personnel and mostly stayed behind the wire. For the most part, I think they have transitioned back to regular life well. TC: Most of the events you describe in the novel occurred (or would have occurred) almost ten years ago. In what ways do you feel the war, and Canada’s role in particular, still plays on in the public consciousness? What more needs to be told to Canadians about what happened during those years? What’s still missing from the narrative? KP: I think that Canadians have for the most part chosen to not reflect much on that war. It is not a good news story. The Global War on Terror, for the West, represents an erosion of ideals—the embrace of torture, the erosion of civil liberties, the disastrous wars—but those painful episodes happened, and they continue to influence the world. Now the Americans have Trump, who promises to re-embrace torture and fill up Guantanamo Bay once again. We may choose to look away, but that does not mean we should. Failed wars take some time to understand. All Quiet on the Western Front was only published in 1929. The important fiction about the Vietnam War took almost a decade to appear. I think what’s missing from the narrative is the sense of grief for what we did. Whatever our good intentions, we killed many many Afghans. Now the Americans have Trump, who promises to re-embrace torture and fill up Guantanamo Bay once again. We may choose to look away, but that does not mean we should. TC: In addition to the novel, you also co-edited Outside the Wire, an anthology of first person essays, letters, journal entries, and reflections from a wide range of war participants, some of whom (such as the late Captain Nichola Goddard), did not return. Was it challenging for you to write about Afghanistan fictionally? In what ways did these first-person accounts influence your novel? KP: Those first-person accounts were the initial impetus for, and entry points into, the novel for me. The conflicting and overlapping accounts in the non-fiction book influenced the way I structured the narratives in the novel, which also conflict and overlap. All of this was challenging, because of the complexity and difficulty of both the war, and the interior landscapes it created. It had taken twelve weeks. The whole country had seemed to lift up and tilt their way. The fighters near the Tajikistan border gave way in one long loud night when B-52 bombers out of Diego Garcia, far away in the Indian Ocean, appeared overhead, as faint as satellites. The Northern Alliance fighters were used to night fighting but they had not been prepared for this. Unshaven and muscular ferenghee pointed lasers on clumps of men and then watched expressionlessly through starlight scopes as they became unclumped. There wasn’t anyone on that battlefield who was as old as the half-century-old bombers flying overhead, turning men into red mist, but that did not matter much. Not to the bombed, and not to the bomb aimers. Two-ton high-explosive Guided Bomb Units dropped into rock cracks four feet wide and the plume of body parts that erupted then was an unholy sight in any religion. Age matters when it brings weakness, but strong old things, like infantry master sergeants and B-52s, are made even more formidable by their age. Chasing the evaporating enemy, the ferenghee had ridden their shaggy Afghan horses until the beasts fell down beneath them and then they ran on their own feet, mechanically and seemingly without tiring. They called in B-52 and Tomahawk missile strikes on every bit of organized resistance they found. One night a Taliban boy named Atta Door was hiding under a rock that rang with steel splinters. He thought to himself, The ferenghee cannot be defeated. With the next concussion, that idea spread from him to the men closest to him, who were frantically trying to operate their radio despite the jamming of the invisible airplanes high in the night sky. From them, that idea rippled out to the riflemen and the leaders and imams of the force. They all sagged, and then the point was no longer debatable. It radiated farther outward, and a few minutes later, it filled the thoughts of villagers in their bedclothes listening to the clear-night thunder filling the valley. Then it swept over the mountains, and headed for Mazar-i-Sharif. And from there it headed for Kabul and Herat. At the Kandahar Airfield, the thought had just found its full expression. That morning, the smoke from the broken dun-yellow plaster of the shattered airport spiralled upwards alongside smoke from one hundred other fires burning on the field. Twenty years ago, before the wars, this building had been an administrative office. It had once been a version of beautiful. Its graceful dome had a Persian sensuality that looked nothing at all like what the private and the sergeant thought of as airport architecture. If you looked closely, you could still see dam- age from the fighting that had attended the civil war six years earlier. But this new assault had been vastly worse. Now the domes were punctured, and rebar straggled free of concrete in half a dozen blasted places. The sergeant from Boise look at the disarray he and his comrades had created. Maybe it would be repaired this time. But it was a pretty broken country. On their way here in their Chinooks, they had seen the hydro dams to the north, unmaintained since the Soviets left, spilling water purposelessly. And no electricity anywhere, except from chieftains’ generators, running on smuggled fuel. A broken place in for more breaking, it turned out. From News From the Red Desert by Kevin Patterson. Copyright © Kevin Patterson, 2016. Reprinted by permission of Random House Canada.